If you like to read about supernatural subjects like ghosts check out these great books available from Amazon. Amazon is well known for their quality service and great prices. If you would like to get some great books and help support True Ghost Tales at the same time we would greatly appreciate it. Hidden Files is full of incredible stories about the unexplained. There are many actual case examples from law enforcement files from the United States and Canada. There are also some personal experiences of law enforcement that occurred while they were off duty. All accounts related in this book are backed up by credible eye-witnesses. When any one person experiences something from the supernatural world it is only natural for others to question and to doubt. Police officers have been well trained to ask the right questions, to pay attention to details and to examine evidence in an objective manner. For these reasons stories documented by law enforcement personnel seem to be more credible than others. The popular television series The X-Files is loosely based upon fictionalized accounts of actual cases. 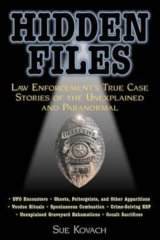 Hidden Files: Law Enforcement's True Case Stories of the Unexplained and Paranormal goes much further and presents true case studies. 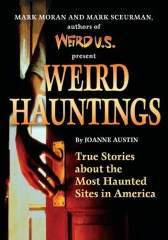 Here is a book about America's scariest and weirdest haunted locations. Many of these haunted places are very well known. Some of them are open to the public for those who would like to visit while others are set in private residences with visitors permitted only by invitation. The supernatural stories presented in Weird Hauntings: True Tales of Ghostly Places come first hand by those who have experienced them. The haunted places range from haunted houses and cemeteries to haunted roads and saloons and much more. Descriptions of these haunting are provided in great detail with lots of eerie color photographs.